Time is money. As a professional your time is most valuable when spent on your vocation. Having to send out bills, correspondence, or client documents can be a wasteful distraction from your real work. 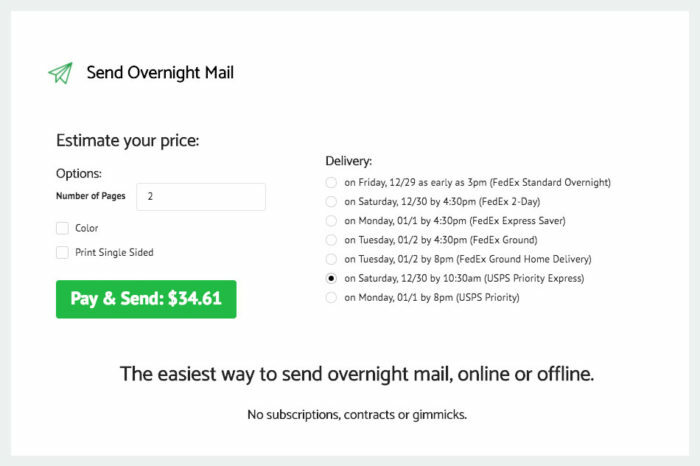 Sendovernightmail.com can help you streamline that process. Simply upload your documents, and sendovernightmail.com will handle the printing and posting for you. Your office can be freed from these needs, and focus on working for your customers. You can now send your mail right from your desk. Mailing will no longer need to be an interruption, instead its as easy as emailing. This is an ideal service for a business requiring physical mail. It brings the efficiency of a cyber-service to your physical documents. The service is charged by the page. The cost is reasonable, with only a slight service charge over the cost of shipping. The actual shipping is done by reputable services, USPS and FedEx. Mailing normally requires buy supplies, printing, packaging by hand. This process is much simpler, and less time consuming. The financial benefit is clear. Once your mail is sent a tracking number is provided by email. This allows you to confirm your delivery is on route. Your mail can be followed through the delivery process, all the way to arrival. You can have peace of mind knowing sendovernightmail.com has taken care of your documents. For total security of your valuable documents your submission will only be held until it has been mailed. Then it will be deleted from the system. No one will have access, meaning you can trust anything from contracts to client information to sendovernightmail.com. This service will allow you to send your documents wherever they need to go, using your computer and internet connection. The simple upload process requires no login. After submitting your document, fill in the addressing information, followed by your own return address. Choose your shipping method and needed arrival date. You will then be taken to a secure payment processor to finalize your transaction. Once your documents are received they will be printed, packaged, and shipped. The whole process is secure for the safety of your mail. Sendovernightmail.com can be a valuable tool to any office. By allowing this professional service to handle your document shipping you can simplify your administrative work. It eliminates the need for stocking envelopes and stamps, and for constant printing. All these tasks can be handled by this reliable online service. This service especially useful for the self-employed, or small offices. You can limit your need for support staff. This frees up both payroll expenses, and the need for physical office space. The more you can digitize cheaply, the better. Sendovernightmail.com lets you focus on your business; your expertise. NUVRO: EASY PROJECT & TEAM MANAGEMENT- DO MORE IN LESS TIME!